Playing against ten men for more than 70 minutes was probably not a scenario Alan Stubbs envisaged ahead of his side’s latest pre-season outing but, nevertheless, the Hibs boss insisted the unexpected twist in Saturday’s 2-1 win at Dunfermline offered his players a useful exercise. An over-the-top lunge at Hibs striker Dominique Malonga with his studs showing earned former Livingston defender Jason Talbot the red card, assistant referee Alan Mulvanny having no doubts such a punishment was warranted as he flagged up the incident to match official Nick Walsh. It was a decision which clearly angered Talbot, who had gone on to go head-to-head with Fraser Fyvie as the Hibs midfielder made his feelings on the challenge known and one which bemused Dunfermline manager Allan Johnston. The ex-Hearts winger admitted he’d have taken the chance to substitute Talbot if given that option, a course of action which isn’t totally unknown in the context of such matches, but no such out was forthcoming. Johnston, who now faces losing Talbot to suspension, said: “You don’t really see many sending-offs in pre-season games. I think the reaction of the Hibs players wouldn’t have helped as well. For his part, Stubbs didn’t want to become embroiled in a debate as to the merits of the decision other than to observe: “I have seen it myself,” a comment which can be read as him agreeing with the officials. But, while admitting he’d had prefered to have been facing 11 men for the entire 90 minutes, the Easter Road head coach insisted the trip across the Forth was worthwhile. 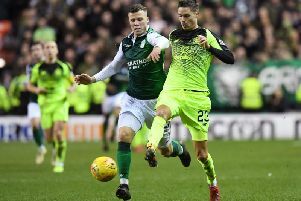 Johnston had conceded his players would be up against it even with a full compliment of players, Scott Allan again pulling the strings with another performance which suggests he’s going to be as central to Hibs plans this time round as he was last season. And there might be even more. Allan has admitted more than once that he’d like to add goals to a game which already encompasses close control, a range of passing to envy and the vision of a clairvoyant. And, with a sumptuous curling effort which soared beyond ex-Hibs goalkeeper Sean Murdoch, he made it two in two following his strike against Berwick Rangers in midweek. A flashing effort from Sam Stanton, a Lewis Stevenson shot which was deflected to force Murdoch into a sharp save down at his right-hand post and a Stevenson cross which was sliced over his own bar by Dunfermline defender Ben Richards-Everton had all preceded Allan’s opener and afterwards Dominique Malonga nodded inches over when he might have expected to score. Stevenson, who suddenly discovered his touch in front of goal last season, added a second six minutes after the interval, turning Jason Cummings’ cutback beyond Murdoch, who then pulled off smart stops from the Hibs striker and then Alex Harris before the winger had legitimate claims for a penalty, when he was clearly pulled back by Richards-Everton, ignored by Walsh. A rash of substitutes from both sides disrupted the flow of play as far as Hibs were concerned, the Capital side ending the game with six teenagers on the park, Pars striker Faissall El Bahktaoui, who had seen one shot crash back off the inside of the post, enjoying more luck as he sent a second effort a minute later beyond Tony Reguero. Stubbs, who takes his side to Ayr United’s Somerset Park tomorrow night for their final friendly, said: “It was what we wanted. It was a step up from Tuesday [at Berwick]. For the majority of the game we controlled it. “Although the pitch looked good, it was very sticky and very dry but overall it was another step towards tomorrow and, once we get that out of the way, obviously the Rangers game. Hibs’ play did, however, become rather fragmented in the final 15 minute as the substitutions left them with just three players over the age of 21 on the pitch and, having started with a 3-5-2 formation which saw David Gray and Stevenson take up station high up either flank, switch to just two at the back, Jordon Forster and Liam Fontaine in front of Reguero. Dunfermline: Murdoch; Williamson, Fordyce, Richards-Everton, Talbot, Geggan (Cardle 76), Paton (Trialist 61), Falkingham, Hopkirk (Byrne 74); Moffat (Trialist 64), El Bakhtaoui. Hibs: Oxley (Reguero 61), Forster, Hanlon (Harris 61), Fontaine, Gray (Duthie 76), S Allan (Dunsmore 76), Fyvie (Martin 61), Stanton, Stevenson (Crane 76), Cummings (L Allan 61), Malonga (Sinclair 76).